Greek ruins throughout the region of Fethiye are symbolic reminders of the rich history of the ancient city of Telmessos. As the largest city in the historic Lycian district, there is evidence of its existence dating back to the 5th century, although the current town name of Fethiye was only granted in 1934. The origin of the name of Telmessos is said to derive from a Greek myth, where the god Apollo transformed himself into a dog to win over the love of the King’s daughter. Once accomplished, he returned to his former self, and their son was named Telmessos, translating to the ‘land of lights’. Historically, the city has been manifested by culturally rich Hellenistic and Roman periods, with their survived remains still visible in Fethiye today. Throughout their different reigns, from the Ottoman Empire to the apparent invasion from Alexander the Great, the residents of Telmessos were actually Greek. 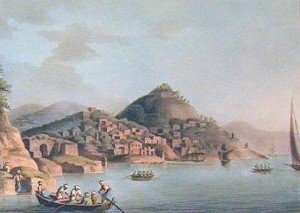 It wasn’t until the 19th century that a population exchange occurred, replacing the Greek citizens with the Turkish who remain there today. 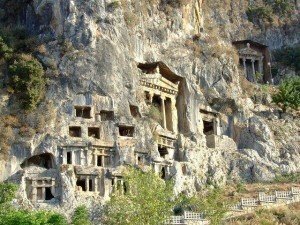 Today, the Lycian Rock Tombs are one of the most famous landmarks in the region. As they’re carved into a cliff face, they are combined with a breathtaking panoramic view of contemporary Fethiye town. However be aware of the uphill climb required to get there! The Amyntas Lycian Rock Tomb dates back to the 4th century, and although little is known about the Lycian period, it can be assumed that Amyntas was an important figure due to the height of his temple. For more spectacular views, Fethiye run daily boat trips to Dalyan which is famous for it’s Roman and Lycian history & cliff faces embedded with magnificent tombs. For ruins from the Roman period, the Ancient Telmessos Theatre is situated right next to Fethiye harbour and dates back to 3 or 4 BC. Major restoration projects have been focussed on this landmark after damage caused by devastating earthquakes and various other catastrophes throughout the centuries. The aim of the rejuvenation has been to restore practical use on this historic site to allow it to continue as an unforgettable venue on the beautiful coast of Fethiye. 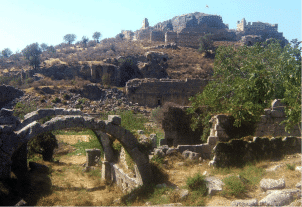 Finally, the ancient remains of Tlos are not to be missed for those seeking to experience the history of Fethiye. Once a city, the ruins include remnants of an acropolis, a Roman theatre and a fortress, detailing areas where baths and a market once were. This entry was posted on April 20, 2016 by Martin.